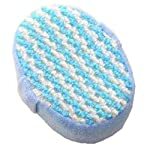 Shower Sponge: Made of recycled and eco-friendly sponge and loofah, soft and durable, healthy for you and your family. Lather Maker: Bath sponge with puff helps create thick soapy lather, It can help relax yourself, clean your skin. Benefits：Sponge and loofah made bath brush makes skin youthfully radiant!